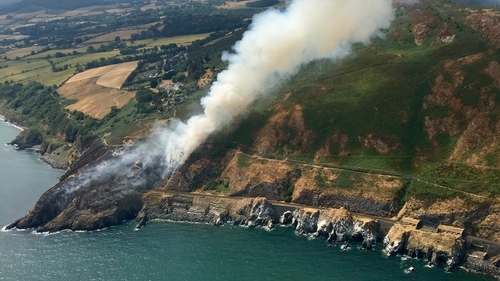 Firefighters have contained a gorse fire that has spread rapidly across Bray Head. Wicklow Fire Service has said conditions on Bray Head and the greater Bray area have improved and that "crews will remain on site through the night to monitor and extinguish" the blaze. The fire service says no homes are in danger from the blaze this evening. People had been allowed to return to their homes in the area after being evacuated yesterday afternoon due to a gorse fire. Firefighters from Wicklow Fire Services remained at the scene overnight to monitor the fire, which is still burning. Crews will continue to damp the area around the fire to control the fire, WFS have said. The Air Corps has also resumed its operations in tackling the blaze. Iarnród Éireann has said the rail line between Bray and Greystones has reopened and DART and rail services are back to normal. The line had been closed yesterday due to fire damage to signalling and telecoms cabling. The fire is understood to have started at around 1am yesterday morning in front of a tent on Bray Head and spread from there.